Tom Brady, the Super Bowl-bound New England Patriots quarterback, took a break from practicing this week to file a $2 million lawsuit against General Motors. The hunky football player is upset that GM allegedly used his likeness in an ad after his contract with the car marketer had expired. 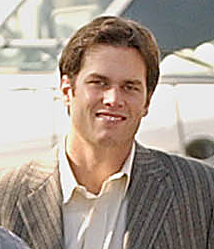 Brady filed the suit on Monday in Los Angeles Superior Court and is seeking punitive damages. The situation could get even more awkward. If Brady is named MVP of the Super Bowl, he will have to take part in a news conference the morning after, where GM-owned Cadillac will let him choose from a variety of cars. Considering that Cadillac is the official vehicle of the Super Bowl and has a relationship with the NFL, Brady might want to resolve this sticky situation sooner rather than later.